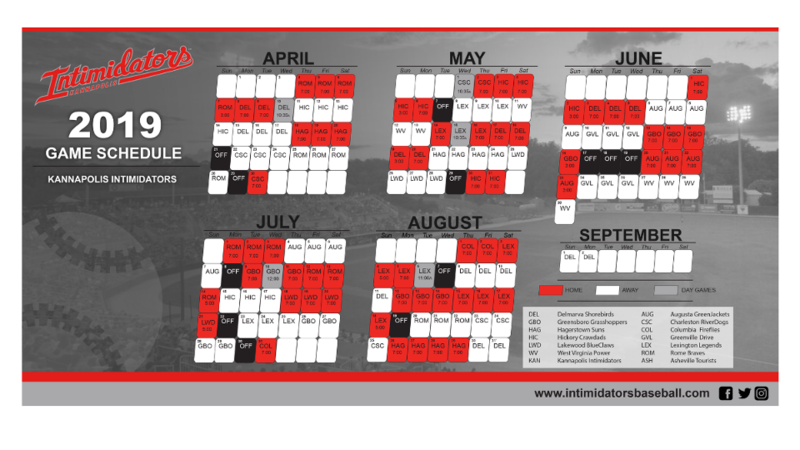 KANNAPOLIS, N.C. -- The Intimidators have released their 2019 schedule complete with game times for all 70 home games. The season begins on Thursday, April 4th with a 7:00 pm game against the Rome Braves. This will be the final home opener & season played at the current ballpark. All Monday through Saturday games will be held at 7:00 pm throughout the season with the exception of Education and Camp Days.The Intimidators will begin play at 10:35 am for Education Days on Wednesday, April 10th, Wednesday, May 11th and Wednesday, May 15th. In addition, Camp Days will be held on Wednesday, July 10th at Noon and Tuesday, August 6th at 11:00 am. Games on Sunday will begin at 3:00 pm in April, May and June before moving to 5:00 pm in July and August. The Intimidators play 140 games, 70 at Intimidators Stadium supported by Atrium Health. Kannapolis opens the 2019 season with a four game series against the Rome Braves. Kannapolis will also host 11 Friday and Saturday night games throughout the 2019 campaign.The marquee matchup will be on Wednesday, July 3rd when the Intimidators host the Rome Braves for an Independence Day celebration. The sky will light up with a post-game Fireworks Extravaganza following the July 3rd game. Full promotional details will be announced in the coming weeks.. The Intimidators, Class A affiliate of the White Sox and member of the South Atlantic League, play all home games at Intimidators Stadium supported by Atrium Health. 2019 Season Seat Memberships, Mini Plans and Group Tickets are on sale NOW! Call today and join the fun! For ticket information, call 704-932-3267 or visit intimidatorsbaseball.com. Following the 2019 season, the Intimidators will play at the City of Kannapolis' new Sports & Entertainment Venue starting in 2020. Founders Club Memberships, an exclusive group that will be among the first to select season tickets for the new Sports & Entertainment Venue, are on sale now for just $370.